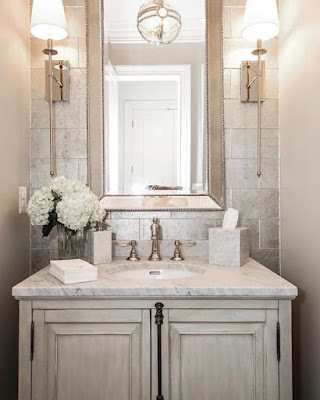 In today's design series I thought I'd share some of the bathroom Pinterest photos I found and how we're using them as inspiration in our home! This is a photo I fell in love with. I love everything about this bathroom but my favorite thing about it is the cabinet design. I printed off this photo and brought it to our first meeting with our cabinet designer. We decided to copy a little of this design in the downstairs guest bathroom and I love how it looks. 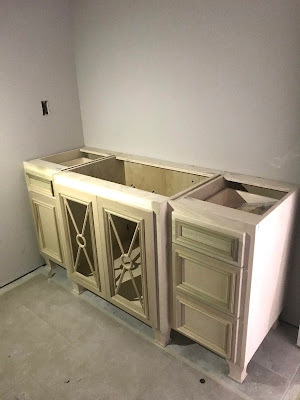 These cabinets will be painted white and we're putting an antiqued mirrored glass behind the X design. 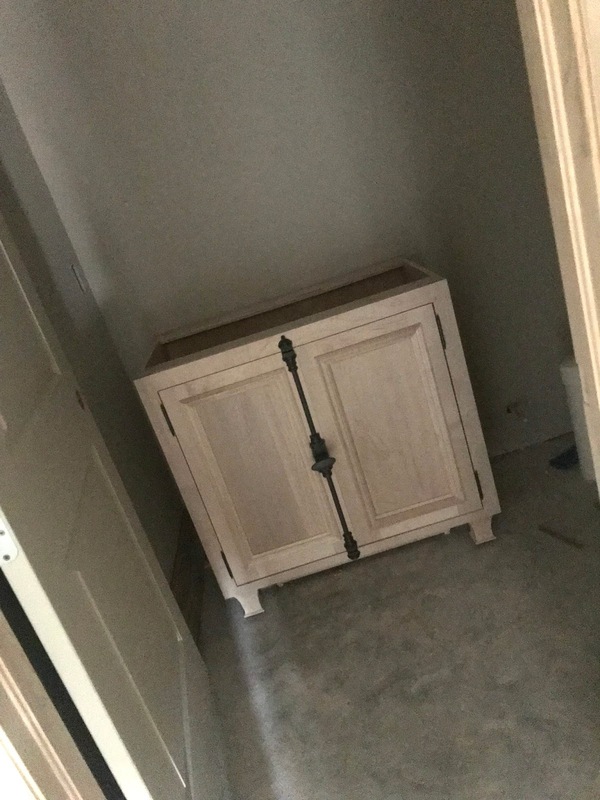 I love how the legs make it feel like it's a piece of furniture instead of a standard cabinet. This X is sprinkled throughout our house in other areas as well and I'm really happy with how it looks everywhere! This bathroom will be so pretty once it's finished. We really wanted to do a little extra in here and make it feel special. I think we're going to achieve our goal when it's all said and done! I feel like I've lived on Pinterest this last year. When I stumbled upon this powder bath photo I immediately showed it to Scott and told him we had to do exactly this. Scott normally puts a vessel sink in his powder baths but I just loved the overall feeling of this instead. It's a great room to be a little fancy so I decided to take advantage of that and have fun with it! We ended up copying the cabinet design and Scott found the exact hardware for us to be able to use as well. I love it because it's different and I feel like it makes a cool statement. We're putting a pretty mirror above the cabinet and this light will hang on the ceiling. We actually have this light in our entry currently and Scott and I both just love it. It's so classic and beautiful and I never get tired of staring at it. 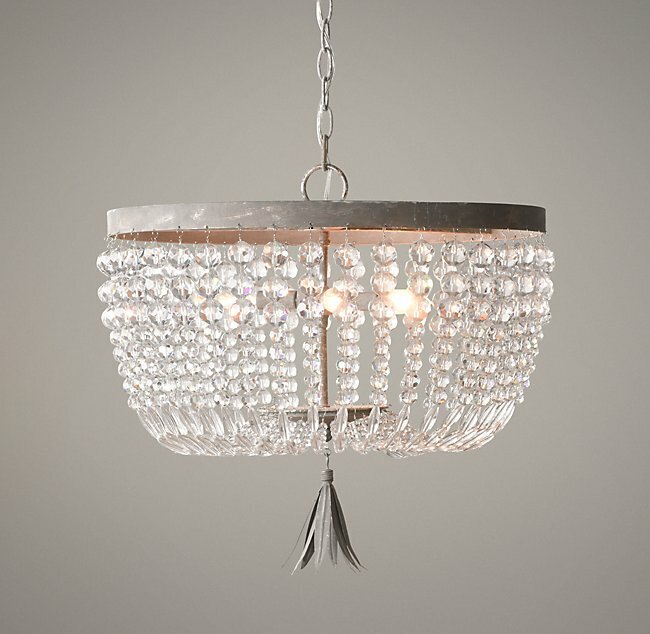 We looked at other lights for our powder bath and just kept coming back to this one. I think it will be the perfect touch to this room. We're also planning on doing something super cool for the walls but I'm going to keep it a secret and show you when it's finished. I am soooo excited about it though and can't wait to show you! !